How familiar are you with RMDs and how they can impact you? 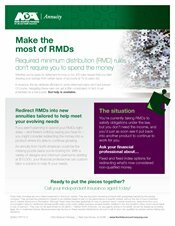 To gauge your level of preparedness for the decisions ahead and assess how you might be impacted by required minimum distributions (RMDs), we've developed a brief quiz. It'll help you and your financial professional talk through where you stand and what direction you might want to take. 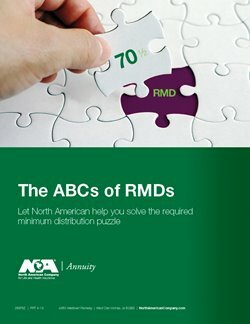 Get an overview of what RMDs are, the types of accounts impacted, and some ideas for what to do with income from RMDs if you don't need it right away. 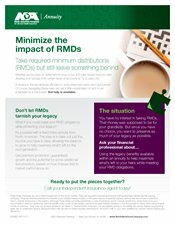 Then, based on your current retirement savings, you can estimate how much your RMDs might be. 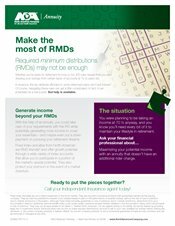 Complete the self-assessment and share it with your financial professional to start an RMD conversation. Have them visit NorthAmericanCompany.com for more information.